Jesus, the Author of prophecy. What is this chart teaching? How to use the Mirror Chart. What the chart is NOT. before and during this study for guidance from the Holy Spirit! In this age of computers, nearly everything comes fast, —too fast. We expect the answer NOW! But that should not be the case with Bible study. And God’s blessing will be yours! of Revelation 10 and the seven thunders. ALL links are vitally important in understanding the seven thunders in this study! or to Further Study (FS) comments. Satan is hard at work, dividing and scattering Christ’s followers in every direction whenever possible. The prophecies give meaning and purpose to the Christian church. Bible prophecy is given as a cornerstone of the church; for the prophecies explain the plan of salvation through Jesus as the Lamb slain for the forgiveness of sin. Jesus is that foundation. But many people have turned away from the study of Daniel and Revelation believing that Jesus cannot be found in the prophecies, and thus they have no foundation, direction, purpose, and meaning in their Christian life. We should study the prophecies, for Jesus is the Author of these books; Daniel (Dan 10:5, 6; 12:7, 8; 3:25) and Revelation (Rev 1:1, 11, 19; 21:5, 6). 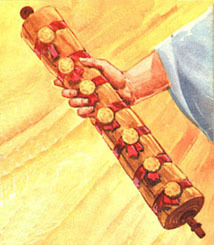 The first verse of Revelation tells us the purpose for the book; it is “the Revelation of Jesus Christ,” and John was told to “seal not the sayings of the prophecy of this book: for the time is at hand.” (Rev 22:10) We might just as well apply this to the book of Daniel, for we also see in Daniel that the Messiah is the main focus; “to finish the transgression, and to make an end of sins, and to make reconciliation for iniquity, and to bring in everlasting righteousness, and to seal up the vision and prophecy, and to anoint the most Holy,” . . . “And he shall confirm the covenant with many . . .” (Dan 9:24, 27) In both of these prophetic books we find that it’s Christ’s sacrifice which is the center of our hope and it is upon Him that we anchor our faith. He is our daily in the Most Holy before the Ark, before the Father, before His Law. He is our daily in the Holy Place, our bread and wine, our light, our prayer. He is our daily in the Court of sacrifice and cleansing. He is our daily in the camp, and is invited into our home, our heart. He is our daily in our journeys of life. For Christ is with us, Immanuel, He is our Daily! What is the Mirror Chart teaching? As mirrors of each other, the two halves of the Mirror Chart, both reflect the glory of the other. Each reflects the purpose of the other —the plan of salvation through Jesus Christ at the cross, and the most important end-result— the cleansing of the Heavenly Sanctuary on the Last Great Day of Atonement. Only a great and loving Master Designer implanted this plan into the history of this world, —to be re-enacted in a more direct fulfillment as the last-day events! “Thou must prophesy again” is the cry of the Mighty Angel to those who will answer His call and eat the book. (Rev 10:1, 11) Prophetic history will be repeated! For Divine purposes, as the last-day prophetic scroll is unrolled, we will be privileged to take part in the events foretold, —and very soon the voices of the seven thunders will be our voices guided by the Holy Spirit! How else will the world know the thunderings of God and be warned of judgments to come in these last days unless we are His voices! The Mirror Chart has hot-spot links to points of interest on the website— littlebookopen.org As you click on an interesting area of study, it will take you to a page of explanation, which hopefully is a brief explanation of the subject. Following the explanatory paragraphs is a link to the Mirror Event, an explanation of the same event on the other half of the Mirror Chart. If you wish to dig deeper, there is a section called Further Study. You will also find FS throughout the writings, which will take you to a Further Study page or section. Time goes from left to right. Please take note that the time of the upper half of the chart is in years, and the time of the lower half of the chart is in days. When you read years, it means YEARS; and days means literal 24 hour DAYS. The upper half of the chart starts with the date BC 457 (the third and last decree to rebuild Jerusalem) and ends in 1844 AD (the end of symbolic time). The lower half of the chart starts with the first thunderous event, the U.S. National Sunday Law, and ends the great controversy with the last thunderous event, the cleansing of the Heavenly Sanctuary. All other thunderous events of Daniel and Revelation happen between these two events. Neither the Mirror Chart nor the chart below it, the Type and Antitype of the 2300 Years/Days Chart, is drawn to scale. When I first started writing down the similarities and differences of the Mirror Chart, I thought that they could easily be separated into these two categories. But the more I tried to separate into similarities and differences, the more I found the similarities are differences, and the differences are similarities. If this doesn’t make sense, hopefully it will as this study progresses. What I mean to say is that the more I study the two halves of this chart, the more I see them blend together. 1. The greatest similarity is the time. The upper chart’s time is interpreted as symbolic years. (Eze 4:3-6; Num 14:34; Dan 9:24). The timing of the events is far more important than we now understand, and the meaning of the times and the appointed times of God’s law will become more evident as time progresses through the seven thunderous events. 2. The events remain in the same scaled positions. It will be these events encased in Daniel’s times that God will voice through the last generation as thunder. As the scroll of the last prophetic times unrolls (has its fulfillment), we will more clearly see why it is important to understand God’s appointed times. are condemned to repeat it! Although the top half of the chart progresses in years, and the bottom half progresses in days, the Mirror Chart is made so that the events line up. In this way we can understand from the events of the past the explanation of the events of the future, —type and antitype of time and events! 4. It’s interesting that there are hundreds, if not thousands of years between the fulfillment of the time and events of the type (the years) and the antitype (the days). One would think that the players and events would have changed because of the difference and distance between the time periods; but this is not the case. The main players, God’s church and the Papacy, —are still the same! 5. LET THE PROPHECIES BE REPEATED! What makes the Mirror Chart years and days similar (nearly identical) is the fact that they are repeated prophecy! So then, if the prophetic books of Daniel and Revelation are to be repeated, THEN LET THE PROPHECIES REPEAT! —as it was fulfilled in the historic type. There is a great deal of confusion, and even chaos, from prophecy teachers who teach last-day prophetic times such as the 2300 days, 1260 days, 1290 days, 1335 days, etc. Those who teach these times all agree that it is literal time (with the exception of the displaced seventieth week teaching), but very few agree on how to arrange the times. In fact, I haven’t seen any two agree! Some teach that the times are in succession, one after another. Some over-lay a few of the times, but leave out other times. Some place a time with question marks on ?either side? —not knowing where it is placed. And all too many build the placement of these literal times around a displaced seventieth week of seven years. Who gives these teachers the authority to arrange the prophetic times according to their own interpretation, and thus rearrange the events? The proper placement of the times of Daniel and Revelation have been positioned by God Himself, and fulfilled in prophetic history. The placement and the position of the times and events are to be repeated, exactly as He set them into prophetic history, but fulfilled in literal time. The seven thunders are not based on man’s ropes of sand, but upon God’s fulfilled prophetic history! We are not to guess at how the last-day events will be fulfilled. Guessing will surely place us on the wrong side at the wrong time! What are the odds of seven prophetic events of history, located in time, repeating in the exact same sequence, but on a smaller scale, also located in time? Only the Mighty Angel, Jesus, can be responsible for the plan of salvation worked out in such a grand design! We are seeing only a small part of the plan which Jesus and His Father discussed in secret councils, —to the exclusion of Lucifer. FS-2) No man could ever come up with a plan like this, let alone have the power to carry it out! And the odds of such repetition are too great for chance. Praise God that Jesus is in charge of events on earth and heaven, and it will soon be shown to the entire world that He is in control of the great prophetic design, from beginning to end! 2. The 2300 years had its fulfillment from BC 457 to 1844. 3. The 2300 days is still future and has its fulfillment between the National Sunday Law (transgression of desolation; Dan 8:13) and the cleansing of the Heavenly Sanctuary (Dan 8:14). 5. 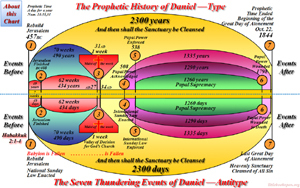 One of the proofs that Daniel’s prophecies were meant to be fulfilled in symbolic years is the prophecy of the seventy weeks-of-years or 490 years, —the coming of the Messiah in the midst of the seventieth week (Dan 9:24-27). Christ on the cross is the fulfillment and center of that prophecy. 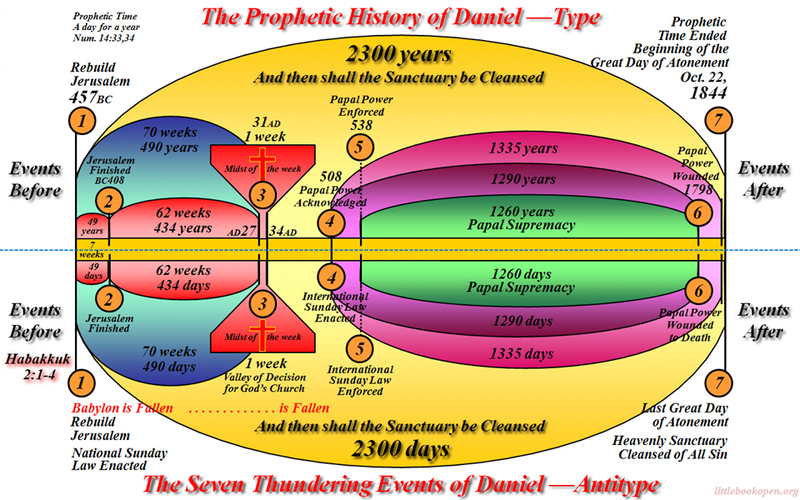 One of the proofs that Daniel’s prophecies are meant to be fulfilled in literal days is the prophecy of the 2300 DAYS. See Dan 8:17, 19, 13, 14; Strong’s Hebrew meaning for days –‘ereb boqer [H6153-H1242], —evening-morning —literal twenty-four hour creation days taken from Gen 1:5, 8, 13, 19, 23, 31; “And the evening and the morning were the first [second, etc.] day.” We must also conclude that NOT yet has there been an end to sin, the last-day events fulfilled, so that the Heavenly Sanctuary can be cleansed of sin, and those sins placed on the head of the scape goat, Satan, which is led into the 1,000 year wilderness. And this, of course, is the ultimate fulfillment of the last event of the time prophecies of Daniel. What the Mirror Chart is NOT. This chart does NOT represent a dual application in the sense that the interpretation can be entirely different for the same prophecy, even though it may be repeated thousands of years apart. 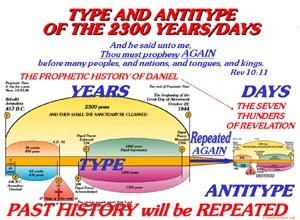 But in fact, this chart shows that it is the repeating of the prophecies of Daniel and Revelation in the most accurate interpretation, the primary application of these prophecies. 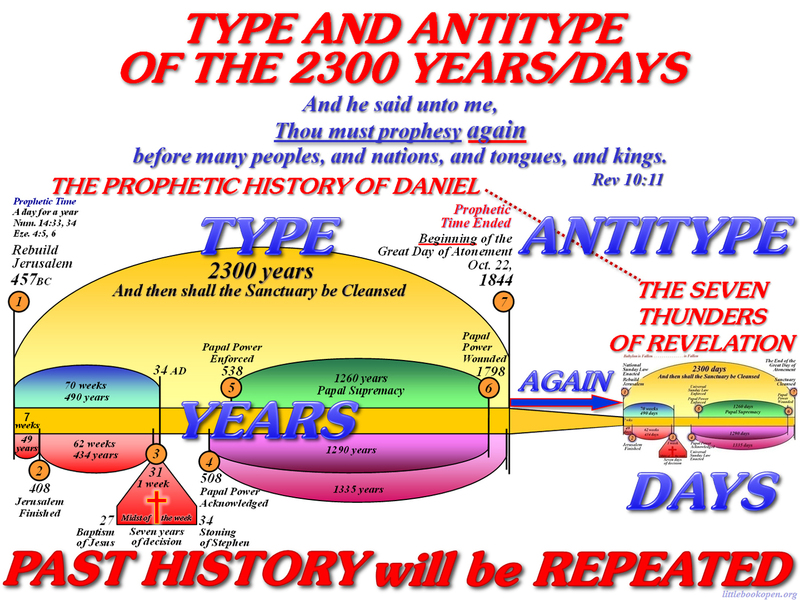 This chart does NOT white wash or nullify the historical prophecies such as the 2300 years and all inclusive prophecies of both Daniel and Revelation. Please take note: The Mirror Chart does NOT teach that the 2300 years, starting in BC 457 and ending October 22, 1844, is done away with or that it is in any way made obsolete. Just the opposite is true! The 2300 years is a shadow of seven last-day events which will have their fulfillment during 2300 days! The historical fulfillment of the 2300 years has been telling generations of its importance and place in prophetic history, and without it, there can be no understanding of the 2300 last-day prophecy to guide us. It is a sad thing that we as the people of God have NOT yet understood its importance in the grand fulfillment of the books!!! Rev 5:1. This chart does NOT give a detailed account of the events of the 2300 years or of the days. This chart only gives a basic and brief understanding of how the events of the 2300 years teach us the closing plan of redemption in the 2300 days. Many books explaining the historical fulfillment are available. here is a list of books. The authors of these books have written valuable lessons we should learn from history which will greatly aid in understanding the repeated prophecies of the near future and the part which we are to play for the glory of our Saviour. The Great Controversy With our Bibles, it is my belief that these books will become the most valuable study books as we live through the events of the seven thunders. We will be astounded at the new light they will give at that time and how we will need to apply the lessons written within to our lives through the power of the Holy Spirit. There is one other book we will long to read over and over, and understanding it will help us to hold fast our faith; —Early Writings, also by Ellen White. It is my belief that God has already led thousands of last-generation saints into these prophetic understandings around the world and that when the appointed time comes, they will know exactly what to do and when to teach these prophecies. They will know that the testimony of Jesus is the spirit of prophecy (Rev 12:17; 14:12; 19:10) and how it will be taught in the fullness of “the just shall live by his faith.” (Hab 2:4) Nothing can stop this ordained purpose of God, for these saints are not controlled by men of nations or church, but by God alone! They shall soon arise with Jesus, and their voices will be heard around the world as peels of thunder and God will be their power! Amen and Amen! May God Bless as you pray that the Holy Spirit will lead you into all Truth for these last days. 1. I will stand upon my watch, and set me upon the tower, and will watch to see what he will say unto me, and what I shall answer when I am reproved. 2. And the LORD answered me, and said, Write the vision, and make it plain upon tables, that he may run that readeth it. 3. For the vision is yet for an appointed time, but at the end it shall speak, and not lie: though it tarry, wait for it; because it will surely come, it will not tarry. 4. Behold, his soul which is lifted up is not upright in him: but the just shall live by his faith.